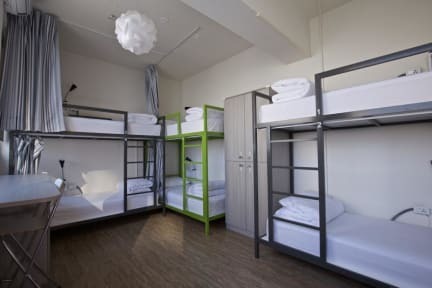 In addition to a variety of cozy dorms (male/ female/ mix-dorms) and rooms, we have nice furnishings, strong showers, a small but fully equipped kitchen and a relaxed café also a communal area, and a broad field attic laundry area. The most unique thing of Wow Tainan is the Yoga studio, we offered guests free use the studio (off the curriculum time) to do exercise, practice yoga, also with the guest only special discount, and we provide the professional yoga lesson. We are enjoying the healthy & slow living life, and love to explore new things and exchange travel experiences with guests from all over the world! Come and experience a new way of backpacking with us in Wow Tainan. Very helpful staff! Location is good, although quiet. Super helpful and friendly staff. Really good map of local area with recommendations. Relaxed vibe. Great location and easy to find. Excellent yoga studio attached with great classes at good prices for guests. A very good hostel with nice staff and convenient equipment such as lockers. Absolutely made our holiday! The coolest, chillest and friendlies hostel we visited. The location is great and situated near the airport and shuttle bus to the high speed rail. The staff and other patrons were very warm and friendly and the facilities and rooms were very cosy and cool. Probably one of the cutest hostels i've ever been in, really nicely decorated with a lot of thought. A great nights sleep and a good days hang out for a great price! Really nice hostel, only had a short stay but I don't have anything to fault. Staff are super helpful and their suggestions made for a great couple of days. Would recommend. Nice place, though bad first impression. I arrived an hour early, 2p instead of 3. Knocked on the door, rang the bell, called their number, no response. Returned later and checked in easily. Was talking with some of the staff, meanwhile phone would ring and doorbell would go off, but nobody cared enough to answer either. Other than above, this is a really nice place. Met some nice guests. Showers had good heat and pressure. Interesting lockers that take a few minutes to figure out. Everything was good except that the beds had a weird plastic on them and the curtains didn't go all the way around. A little far from train station but still walkable. Has medium sized lockers in room. Nice neighborhood. Overall good stay. Wow Hostel is a great hostel for travellers, it has a nice common area to hang out in and is pretty affordable. The bed was comfy and the rooms are pitch black so you sleep like a baby which is great after a day of travelling. The only issue I had was a matter of cleanliness like hair in the showers and the room was smelly from somebody else's shoes. There's not much the Hostel can do about that though. Maybe just ask people to put shoes outside in shoe rack? First and foremost I have to say the staff there was superb and helpful. I only have two complains. The first one is they keep a plastic cover to protect the mattress, it gives you a lot of heat, and also is very noisy when you move. I always wanted to try yoga for the first time, and they provide classes at a reasonable price. However, bear in mind the trainer does not speak any English, she will not correct you any position and besides. Overall she was quite rude.